Check your ad group's status and see what the different statuses mean. 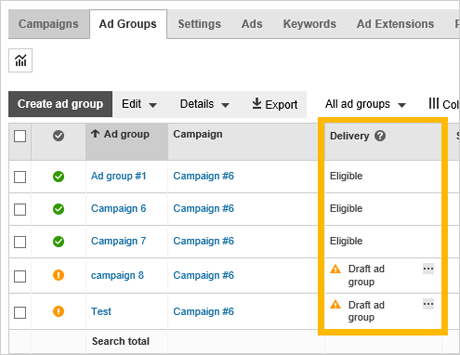 Your ad group status tells you if your ad group, including all ads and keywords within that ad group, is active or not. Keep in mind that ad group status is different from campaign, ad, and keyword statuses. Ad groups fall within campaigns, and within each ad group, there are ads, keywords, and bids. Pausing an ad group also pauses all of the ads and keywords within that ad group. If you want to pause all ad groups, ads, and keywords within a campaign, simply pause the entire campaign. On the Campaigns page, click the Ad groups tab. Check the statuses of individual items in the Delivery column. Click the Delivery header to sort the ad groups by status. The ad group is set to run. As long as your active ad content has at least one active keyword associated with it (and there are no errors with your account), your ad is available for people to see. No ads are running for this ad group, ad, or keyword because the ad group’s end date has passed. To continue running ads for the ad group, go to the Ad groups tab, click on the end date in the End date column, select a new end date, and then click Save. No ads are running for this ad group, ad, or keyword because the ad group is set to pause. To start running ads again, go to the Ad groups tab, select the checkbox next to the appropriate ad group, and click Edit > Enable. No ads are running for this ad group, ad, or keyword because the associated ad group is still in draft form. To start running ads, go to the Ad groups tab, select the checkbox next to the appropriate ad group, and click Edit > Enable. No ads are running for this campaign, ad group, ad, or keyword because the campaign is set to Pause. No ads are running for this campaign, ad group, ad, or keyword because your campaign budget has been used up. To increase your budget, go to the Campaigns tab, click in the Budget column for the campaign, increase the budget amount, and then click Save. Your account must also have no account errors or none of your ads will run, regardless of your ad group status. Find out more about account errors. If you're still not sure your ads are up and running, check out Are my ads live? and Why can't I find my ad?